UPS trucks rumble up and down our street so often during the holiday season that it’s easy to think of the company as a faceless megacorporation shuttling goods from site to site. And sure, UPS does that. Anyone who’s ever been stuck in traffic behind a loud brown vehicle full of packages from Amazon and Ebay has probably cursed UPS – at least under their breath. But it’s important to remember that Big Brown isn’t just a massive fleet of vans and airplanes. It’s also a set of locally owned franchises providing valuable services. I got to know our local UPS store a few years ago when I inherited a surprisingly large collection of porcelain figurines. They were beloved by my mother but, to put it mildly, not to my taste. So I decided to sell them on eBay. The selling was the easy part. The figurines were lovingly cared for across many decades, so they were in mint condition. The tricky part was figuring out how to ship them so they wouldn’t break. Of course, I could have done this myself, but I worried that if they broke I’d be on the hook, and that would diminish my ability to make a little money off the transactions. So I investigated my options and discovered that I could pack and ship with UPS. Using their services made me eligible for insurance in case anything ever happened. And it didn’t. Mostly. Over the last two years, nearly 50 figurines arrived safely to their new homes. Along the way, I got to know the crew working the local store, which is over on Zelda Road, next to Ted the Wine Guy and Publix. Josh was particularly helpful, recognizing me when I came in (“Another figurine?”) and making sure each transaction was seamless. I saved one of the biggest for last, a lovely set piece with an older man and woman sitting on a park bench. When it finally found a buyer in New Jersey, I took the large box over to the store. It was packed and shipped as usual. And then calamity struck! By the time the box arrived in Jersey, she’d become decapitated! Of course the buyer was upset, and I was too – my mother had cherished that piece. Fortunately, I had insurance. So I called Rosario at the UPS store, who’d done the packing, and told her about the issue. I got a phone number for the buyer via eBay, and handed it over to UPS. The process sprang into action. Once eBay’s claims service figured out my package was insured, they assured me that there was no problem with the transaction. The buyer got a refund, and just a week or so later I got a hand-written check in the mail from our local store. That’s good old-fashioned customer service; not the kind you’d expect from a big international corporation, but the kind a locally owned store gives to its customers. 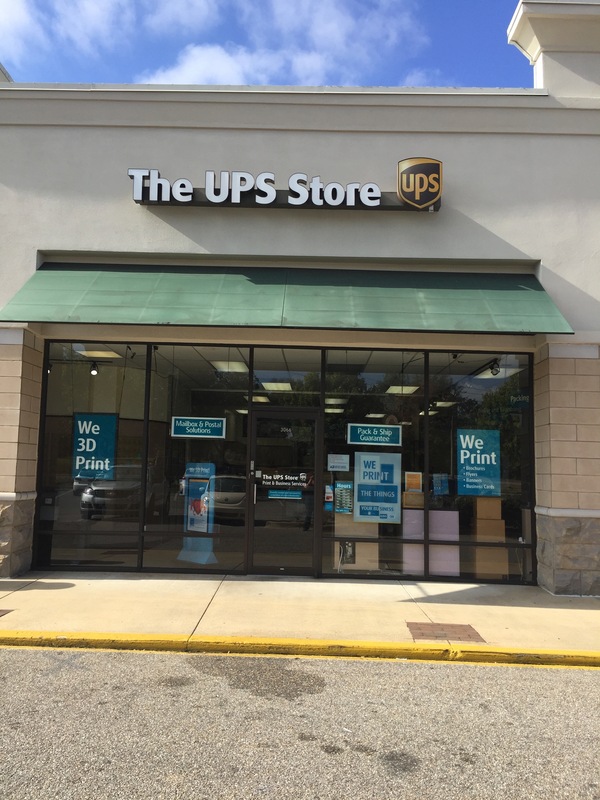 Here are some other good things about our local UPS store. First, they’ll shred documents for you. This is very useful if, despite your best intentions, you forget the various local free shredding days. Second, they have an actual 3D printer. Which is so cool. We keep meaning to print something just to see it in action. Third, it turns out they’re beloved by local artists on account of their giant printers and wide array of paper sizes. In a world where so many of our tasks get done online without interacting with actual humans, it’s nice to know there’s a role for good customer service in a locally owned business. Kate and Stephen are Midtown residents with two cats, a dog, 18 fish, a garden, an old house and a sense of adventure. They write about life in Midtown here and about life in Montgomery at their blog Lost in Montgomery.